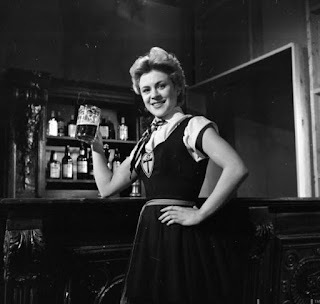 ‘Blue Murder at St Trinians’ was released in December 1957. Harold Macmillan was the Prime Minister, representing the Conservative Party. Looking at lists of notable events in this particular month, the first televised Queen’s Speech on Christmas Day is the most eye-catching. Scrolling back, this was a year for technological advances. Jodrell Bank Observatory became operational and the television programme ‘The Sky at Night’ was broadcast for the first time. The first Premium Bonds were also drawn by ‘ERNIE’. No doubt much was learned from the fire that broke out at Windscale nuclear plant. Elsewhere, it was a year of embryonic development. This was the year when Lennon met McCartney and when the Wolfenden Report was published, recommending legalisation of homosexuality. Things were happening that, though it was not immediately apparent, would lead to major changes further down the line. We were at last starting to look beyond little Britain…and to reflect that, St Trinians school went to Rome! I'll drink the health of anyone who downloads one of my books - click here!